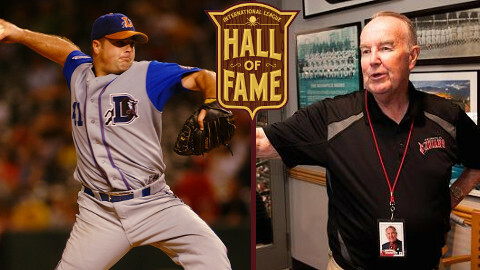 The International League announced today that three-time All-Star pitcher Lee Gardner and Indianapolis Chairman Emeritus Max Schumacher, who is in his 61st season with the Indians, will be inducted into the circuit's Hall of Fame as members of the Class of 2017. The two men were elected to the IL Hall by a vote of living Hall of Famers, longtime executives, broadcasters, and members of the media. The members of the Class of 2017 have been added to the International League Hall of Fame plaque display. Both inductees will be presented with "The Curtain Call" statue during individual enshrinement ceremonies yet to be scheduled. The IL Hall of Fame plaque display does not have a permanent home, but rather serves as a traveling testament to the storied legacy of the International League. During the first decade of the 21st century, there may have been no more dominant reliever in the International League than Lee Gardner. He was the closer for three Governors' Cup champion teams: the Durham Bulls in 2002 and 2003, and the Toledo Mud Hens in 2006. Gardner holds the single-season saves record for both franchises. He played for the IL in three Triple-A All-Star Games and earned a Postseason All-Star nod in 2002. For the decade of 2000-09, Gardner had 107 saves (28 more than any other IL pitcher) and posted the circuit's 5th-best ERA at 3.03. During his career, Gardner appeared in 86 Major League games with Tampa Bay and Florida. His best MLB season came in 2007 with the Marlins, during which he appeared in 62 games and had team-best numbers in both ERA (1.94) and WHIP (1.21). Indianapolis native Max Schumacher joined the Indians organization in 1957 after playing baseball at Butler University and serving a two-year stint in the U.S. Army. Schumacher became General Manager in 1961, and under his leadership the Indians have enjoyed widespread recognition for their ongoing commitment to excellence. He was a guiding force in the American Association until the 1998 consolidation of Triple-A Baseball from three leagues into two. Max has served as Corporate Secretary to the International League for the past 19 years, during which time he has lent his expertise and shared his experience for the betterment of the League. Among the many accolades he's received over the years, Schumacher was recognized with the prestigious "King of Baseball" award in 1997 for long-time dedication and service to the industry. Named the team's Chairman Emeritus after sixty seasons with the Indians, he continues to provide mentorship as an enduring asset for both the franchise and the League. The IL Hall of Fame, established in 1947, was dormant from 1964 until the League's 125th Anniversary season in 2008. Following a three-year transition period (2008-10) in which a total of 50 individuals were inducted after having been selected by a committee, the Class of 2017 was the seventh chosen by the current annual election process. Each year the top three vote-getters who also receive a vote on the majority of ballots returned are elected. In the most recent two elections, there were only two candidates to receive a vote on the majority of ballots, resulting in a reduced size Class of 2016 and Class of 2017. Complete statistical data and biographical information on all 120 members of the IL Hall of Fame, along with a copy of the International League Hall of Fame policies, procedures, and guidelines are available at ILBaseball.com.